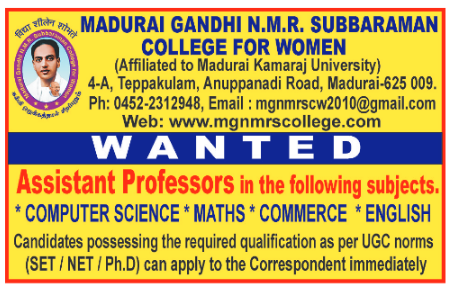 Madurai Gandhi N.M.R Subbaraman College for Women, Madurai has advertised in DINAMALAR newspaper for recruitment of Assistant Professors jobs vacancies. Interested and eligible job aspirants are requested to apply immediately from 07th April 2019. Check out further more details below. College Profile: Madurai Gandhi N.M.R.Subbaraman College for Women, affiliated to Madurai Kamaraj University was inaugurated by the then Vice-Chancellor Thiru. Karpaga Kumaravel of Madurai Kamaraj University and it was started on 19th August 2010. The Sourashtra Girls Vidya Sangam started this College in memory of Madurai Gandhi N.M.R. Subbaraman, Ex. M. P. who dedicated his whole life for the welfare of poor and down trodden girl students. Impelled by an urge to impart Education at all levels in Arts, Science and commerce and inspired by a strong benevolence.